3 Bedroom Detached House For Sale in Alcester for Offers Over £280,000. A show home standard three bedroom detached home built in the last two years by Taylor Wimpey. 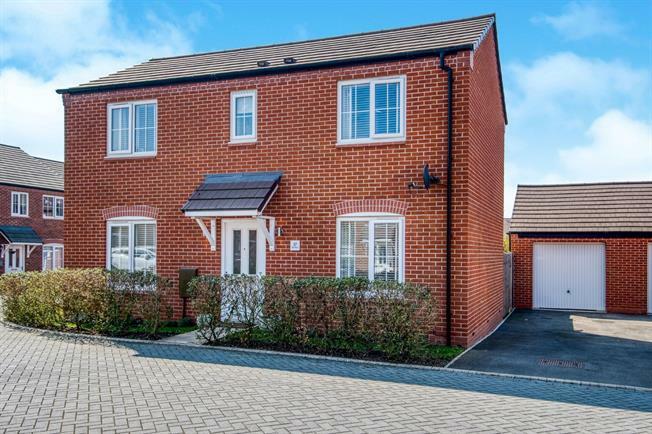 Located in a small cul-de-sac within the ever popular Riverside town of Bidford on Avon. The current owner has upgraded the property throughout including appliances, flooring, fully tiled bathroom and en-suites. The outside space is a tranquil sanctuary where the garden enjoys a walled aspect with well stocked borders and a flagstone patio seating area ideal for the summer evenings. The accommodation is light and airy and comprises; entrance hall, cloakroom, sitting room with dual aspect and French doors onto the garden, breakfast kitchen again with dual aspect and all integrated appliances. Upstairs is a master bedroom with fitted wardrobes and en-suite shower room, two further bedrooms and a bathroom. Outside as mentioned is the manicured garden, garage and driveway allowing parking for two cars. Viewing is a must! Accessed via a UPVC door. Radiator. Stairs rising to the first floor. White suite allowing a low level w.c and wash hand basin with tiled splash back. Tiling to the floor. Radiator. Double glazed window to the front elevation and French doors to the garden. Laminate to the floor. Radiator. Range of matching wall and base units including roll edge work incorporating a stainless steel sink and drainer unit. Integrated is a four ring gas hob and electric eye level double oven. Further integrated is a fridge freezer, dishwasher and washing matching. Porcelain tiling to the floor and tiling to the walls. Double glazed windows to both the front and rear elevations. Boiler concealed in a wall cupboard. Feature downlighters. Two radiators. Double glazed window to the front elevation. Two double fitted wardrobes with mirrored doors. Radiator. A modern white suite with a low level w.c, wash hand basin and double tray shower. Stylish tiling to the walls and floor. Double glazed obscure window to the rear elevation. Radiator. Double glazed window to the front elevation. Fitted wardrobes to one wall with mirrored doors. Radiator. White modern suite allowing a low level w.c, wash hand basin and bath with shower over. Tiling to the walls and floor. Double glazed obscure window to the front elevation. Radiator. A stunning well stocked landscaped garden with planted borders. Mainly laid to lawn with a patio area. Enclosed by walling and fencing with a side gate allowing access to the driveway and garage. Up and over door. Storage into the eaves.